Church Lady: Hello. I’m the Church Lady, and this is ‘Church Chat’. Well, well, well, what an honor it is to have our first guest, Governor Piyush Jindal. Welcome Piyush! Governor Bobby Jindal: Thank you Church Lady. It’s good to be here and you can call me Bobby, I changed my name years ago. Church Lady: (rolling her eyes) What a lovely little name! Bobby, Bobby, Bobby! Just like Bobby on the Brady Bunch! Governor Jindal: Actually, that’s how I chose my name! Church Lady: Well now, isn’t that special? Let’s talk about the little crack your behind is in right now Bobby. It seems you’ve found yourself between the legislature and the taxpayers in what we might call the proverbial rock and a hard place. Tell me about the deals you cut behind closed doors with legislators in exchange for not vetoing their pay raise? Governor Jindal: (clearing his throat) How on earth do you know about that? Church Lady: The Church Lady knows everything dear! So, Bobby, when you said ‘Let’s give our homeland, the great state of Louisiana, a fresh start’ after the election, did you mean throwing taxpayer’s under the bus in favor of legislators? Governor Jindal: No, uh, but I also said that ‘our people don’t want to be amused by our politics anymore, we don’t want to be entertained. I said I would create ethics reform too! Church Lady: Well, it’s too late for that Bobby! Hmmm! Ethics Reform! What a charming little euphemism! Is that what we’re calling this now? Governor Jindal: I don’t know what you are implying. Church Lady: Of course you don’t dear! (snickering) So, tell me Bobby, what on earth made you think that you could put your little head in the sand and imagine that a 200% pay raise for legislators would just allllllll go away and nooo one would notice? Governor Jindal: Well a voice inside of myself sort of told me to focus on ethics reform, doing away with the Stelly Tax in a year or so, and to not upset the legislators who want full control of taxpayer money for pork projects and raises! 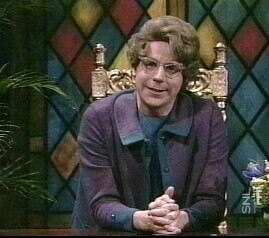 Church Lady: How con-veeen-ient! I think you need to look deeeep inside of yourself, Bobby, at what was thrusting and throbbing inside of you and think just what might that be that was telling you – hmmm (taps her fingers on her chin) What could it be? What could it be? Could it be – Satan???? Church Lady: Satan!! Mephistopheles!! The Prince of Darkness!! The Beast Master!! Satan himself!! Church Lady: Oh, you think you’re so superior, don’t you Bobby? A Rhodes Scholar? Maybe you’re just a rogue scholar? Kind of makes me feeling like dancing, dancing, dance the night away! and Don’t ya Come Back No Moreeeeeeeeee! Governor Jindal: (screaming from backstage) I don’t dance, except around political pay raise issues!